As we’ve learned (ad nauseum) basing causal claims on a simple bivariate relationship is fraught with potential roadblocks. Even though there may be a strong, and statistically significant, relationship between an independent and dependent variable, if we haven’t controlled for potentially confounding variables, we can not state with any measure of confidence that the putative relationship between the IV and DV is causal. We should always statistically control for any (and all) potentially confounding variables. Additionally, it is often desirable to dig deeper into the data and find out if the units-of-analysis are fundamentally different on the basis of some other variable. Below you may find two plots–each of which shows the relationship between margin of victory and electoral turnout (by electoral district) for the 2017 British Columbia provincial election. The first graph plots a simple bivariate relationship, while the second plot breaks that initial relationship down by political party (which party won the electoral district). It could conceivably be the case that the relationship between turnout and margin of victory varies across the values of political party. That is, the relationship may hold in those electoral districts where party A won, but not hold in those in which party B won. We can see here that there is little evidence to suggest a difference in the relationship based on which party won the electoral district. Can you think of another `third’ variable that may cause the relationship between turnout and margin of victory to be systematically different across different values of that variable? What about rural-versus-urban electoral districts? Upon discussing the NHL game results file, I mentioned to a few of you that I have used R to generate an NHL draft lottery simulator. It’s quite simple, although you do have to install the XML package, which allows us to use R to ‘scrape’ websites. We use this functionality in order to create the lottery simulator dynamically, depending on the previous evening’s (afternoon’s) game results. Here’s the code: (remember to un-comment the install.packages(“XML”) command the first time you run the simulator). Copy and paste this code into your R console, or save it as an R script file and run it as source. # and parse web pages. #                                script the first time. doc <- htmlParse(url) #parse the page to extract info we'll need. # of data that we'd like to extract from the web page. # Now we can use xml to extract the data values we need. # well (and percentages), which is problematic. # "%" character from each. # Third, we have to convert the character format to numeric. # The code below does the clean-up. #Now, let's finally 'run' the lottery, and print the winner's name. We noted today in lecture that Polity IV gives countries like the United States very high scores on the ”democraticness” variable, even during periods when a majority of the adult population–African-Americans, and women–were legally not allowed to vote. While Switzerland (1971) was the last European democracy to grant universal suffrage for women, Portugal was the last European country to do so (1976)–Portugal was run by a military dictatorship during in the early years of the 1970s. Before we can say anything definitive about the concepts and ideas that we’re studying, it is imperative that we have some understanding about whether the data that we observe and collect are actually “tapping into” the concept of interest. For example, if my desire were to collect data that are meant to represent how democratic a country is, it would probably not be beneficial to that enterprise to collect measures of annual rainfall. [Though, in some predominantly agricultural countries, that might be an instrument for economic growth.] Presumably, I would want to collect data like whether elections were regularly held, free, and fair, whether the judiciary was independent of elected leaders, etc. That seems quite obvious to most. The Economist’s Intelligence Unit puts out an annual “Global Livability Report” , which claims to comparatively assess “livability” in about 140 cities worldwide. The EIU uses many different indicators (across five broad categories) to arrive at a single index value that allegedly reflects the level of livability of each city in the survey. Have a look at the indicators below. Do you notice that the cost-of-living is not include? Why might that be? Delaney Ryan is a 23-year-old anthropology student at Simon Fraser University. Unlike many of her contemporaries, she voted in both the last provincial and federal elections. She meets all the criteria for voter registration, having her driver’s licence and maintaining the same address since voting in those elections. She can’t understand why, then, this time, she wasn’t registered on the voters list. “I had heard rumours about people not being registered, and a friend’s Facebook page had postings on it of other people finding out they were suddenly no longer registered. A lot of these people seemed to be in the same demographic as me. So I went online (to the Elections Canada website) and checked, and I wasn’t on it, either. So, go to the Elections Canada website and verify that you are registered to vote this October 19. David Moscrop of Maclean’s magazine, has been writing a series of articles on the psychology of politics. Why do we have the political opinions that we do? The answer, as you now know, is a combination of environmental, demographic, and personal characteristics. More and more, political scientists and psychologists have been researching the importance of psychology as a factor that influences political beliefs and behaviours. But the truth is that your gut is as much a source of your political decisions as your rational brain, and much of the time your gut—emotions, feelings, intuition—does its work outside of your awareness. Yep. The faces of the candidates, the pitch of their voices, their gender and ethnicity and height; whether or not you believe in God, whether or not you’re hungry, whether you’re a lawyer or dock worker or school teacher; the effects of political advertising, the effects of issue framing or priming, the effects of your peer group; your partisanship, your family, your fears. 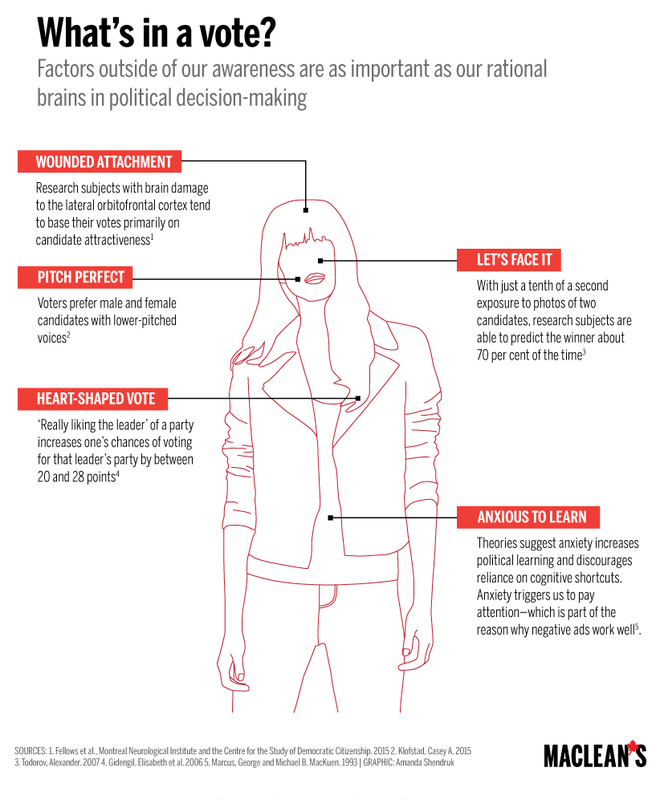 Here we see an image taken from the article, that demonstrates the various parts of our bodies that are involved in the making of political decisions. The Conservative Party of Canada website in the weeks leading up to the 2015 federal election. Today, we continue to look at Canada’s glorious Prime Minister, Stephen Harper. Besides being the current PM of Canada, Stephen Harper is also an honourable MP (member of parliament–we Canadians are forever grateful to the glorious denizens of Calgary Southwest*) and the leader of the federal Conservative Party. Below you’ll find some screenshots of the scrolling images on the home page of the Conservative Party website. You’ll notice that the political campaign operatives have decided to portray PM Harper is our daddy, whose job it is to protect us in a dangerous world. Protect our jobs (presumably from being snatched away by foreigners); protect our children; protecting our economy, and protecting us from terrorists and others who would do us harm. Will it work? *Calgary Southwest is no longer a federal constituency. It has been dissolved into Calgary Heritage and Calgary Midnapore.